Q: How can we book corporate booking at the Dome@Rawdhat? 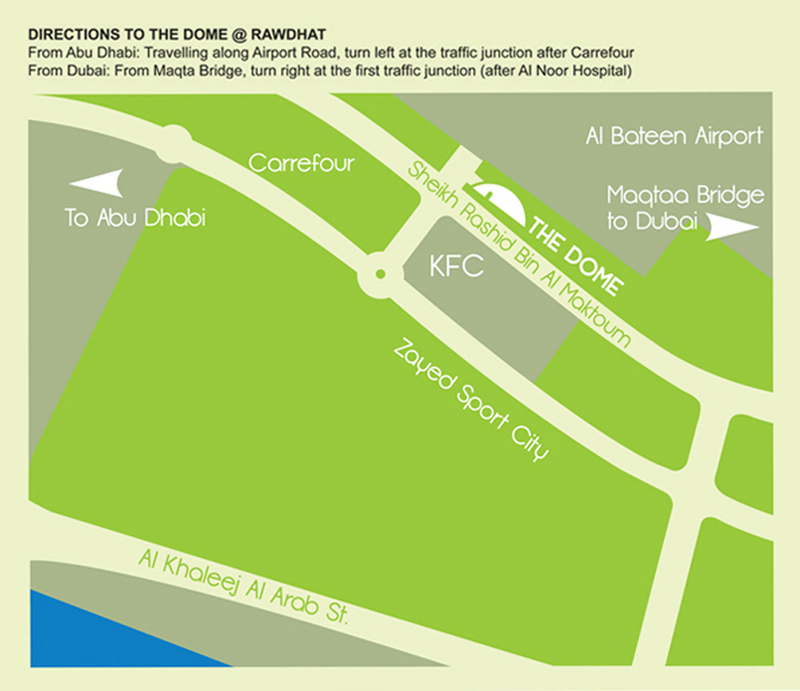 A: You can book by contacting info@thedome.ae. When you contact us please make sure to give us your preferred dates and contact details and we will get back to as soon as possible. Q: How long is each corporate booking and contract? A: Each corporate booking is valid for 3 months, then you must re-book. *Please make sure that you request your booking I time to get the requested time. Q: Is there age limit to who can come to your facility? A: No! We offer activities to all ages, from 0 years to seniors and to both genders. The Dome@Rawdhat is always looking for new initiative to start. Q: How can I subscribe to your monthly newsletter? A: Please email us your email address at info@thedome.ae and we will make sure that you email address is entered into our database. Q: Can we rent the lounge for personal use? A: Yes! The lounge in our facility can be rented for corporate use, personal, as long as you abide to the Do’s and Dont’s. Q: Can we host a concert at your facility? Q: How many people in total can fit in your lounge area? A: Around 260 people can fit in lounge area. Q: How many people can fit inside your Indoor facility? A: Around 300 people can fit inside our Indoor facility. Q: How can we know more about your events/tournaments at the Dome@Rawdhat? A: You can call us, or you can check our website regularly or you may like our Facebook Fan page and Twitter account for daily updates. Q: How do we join the Rawdhat Football Club? A: You can join the Rawdhat Football Club by sending us your details to the info@thedome.ae and we will pass on your details to coach. Q: How many soccer academies do you have at the Dome@Rawdhat? A: We currently have 3 different soccer academies at our facility please view courses at our website.